When it comes to taking a step forward in technology that changes the traditional methods of doing a specific task, people think a lot. Here the specific task is cooking, the traditional method is using a gas stove, and the step is to start using an induction cooker. There are a lot of questions when it comes to using an induction cooker, which makes it difficult for people to take a step ahead. We at Bijli Bachao are here to answer them and help people get rid of the confusion. This article aims at providing all the relevant information on Best Induction cookers/cooktop/stove in India in 2019. 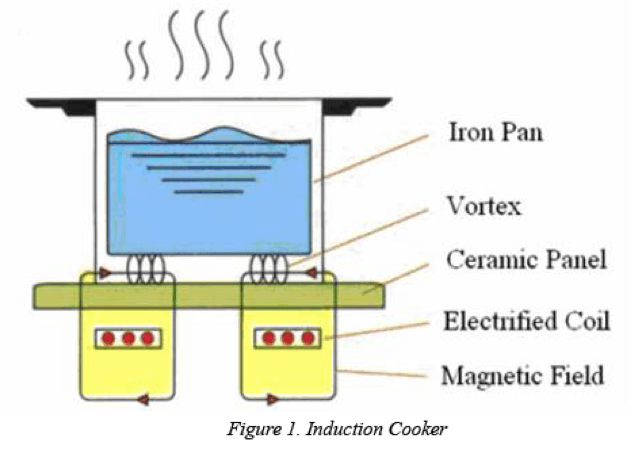 Induction cookers work on the principle of electromagnetism. There is a coil of copper wire placed below the cooking surface (generally made of glass-ceramic), above which the cooking vessel is placed. An alternating current flows through the coil, which creates a magnetic field. The vessel kept above the cooking surface gets induced with a current due to the magnetic field. This current flowing in the vessel, through the cooking surface, generates resistive heating which inturn heats the food in the vessel. Instead of heating the area around the vessel, like in the case of a gas stove or an electric stove, an induction cooker heats the vessel only. This leads to less wastage of heat, in turn keeping the kitchen cool. Most of the Indian dishes that are cooked on a regular basis in every house, can be prepared using an induction cooker. Some brands of induction cookers also provide specially programmed cookers with preset functions for Indian cooking. But some Indian food like phulkas (chapattis) can get difficult to be cooked on it. Induction cookers require compatible cookware to work with it. Utensils made up of ferromagnetic (having magnetic properties) material like iron and steel can only be used. If you want to test whether your existing cookware is compatible or not, simply take a magnet near the base of the cookware, if it clings, your cookware is compatible. Units Required to heat 10 lts of water. *The prices are indicative and may vary depending on the type of cooker and brand. Are induction cookers faster than LPG stoves? Cooking definitely gets faster with the use of an induction cooker as compared to the LPG stoves. This is so because in induction cookers the vessel itself becomes the heat source, heat loss decreases and cooking is faster. Consumer Voice, an organization that raises consumer awareness published a report based on the tests that were conducted on various brands of induction cookers. They found that depending on the brand, an induction cooker consumes a minimum of 2.58 minutes to a maximum of 4.04 minutes to boil 1 litre of water. On the other hand, an LPG gas stove takes about 5.36 minutes to boil the same quantity of water. Also, heating time is directly proportional to the wattage of the cooker. The efficiency is measured in terms of the ratio of energy that gets delivered to the food to the energy consumed by the cookers is dependent on the size of the pan and the heating flame/surface. So yes, induction cookers have the highest efficiency. Absence of open flames make them very safe to use. Since the heat is eventually produced by the vessel itself, the surface of the cooker below the vessel is much cooler than the vessel, making it less risky to use. There is a control system that stops the heating process if a vessel isn’t kept on the cooker or the vessel isn’t large enough. The magnetic field produced gets projected about 2-3cms, which does not pose any harm to users (People with cardiac implants should consult their doctors before using it though). 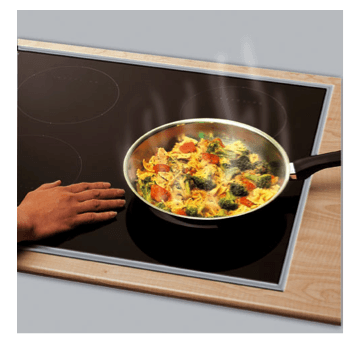 Some induction cookers also have an anti-magnetic wall that ensures safety for users from the magnetic radiations. Temperature control feature regulates the energy supply very easily and efficiently, making it very safe to use. Overheating of food can be restrained by setting up the timer. Induction cookers are very safe to use compared to other conventional cookers, but certain precautions need to be taken to make it completely safe to use like, not to touch the vessel without some hand protection, not to forget to turn it off, avoid taking a magnet too near to it. o Very safe due to the controlled mechanism and the safety features. o Easy to clean and manage. o Consumes less energy, which makes it environment friendly. o Heat wastage is minimized, which increases efficiency and results in cooler kitchens. o Faster than conventional gas stoves. o Temperature controller and timer make it easy to use. o Expensive than regular cooktops. o No electricity, no cooking. o Food that require open flame to be cooked (e.g. Chapatti) cannot be cooked. o Works only with flat bottomed vessels/pans and very small or very large vessels can raise issues . So, what did we cook?